Middle Eastern and North African food need a lot more love. They use fresh ingredients, are often budget-friendly, and aggressively, mouth-wateringly spiced. This dish is a perfect example. Shakshuka consists of eggs poached in a spicy tomato sauce. 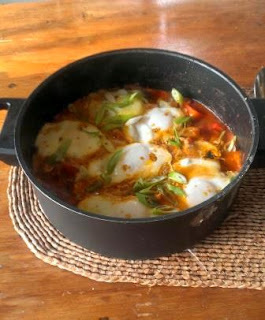 Though it often appears on breakfast menus because of the eggs, in Israel it’s a popular dinner item. No matter the meal you serve it at, it’s amazing with toast or lightly toasted pita bread cut into triangles. This meal is also great for hangovers. 1 Tablespoon of Ras El Hanout – This is a spice mix commonly used in Moroccan cooking and is available at most ethnic grocery stores. Can’t find it? No problem! Mix equal parts ground ginger, ground cumin, ground coriander, and a pinch of ground cinnamon, a little cayenne pepper, and if you like, some ground cloves and allspice. ½ Cup of Plain Greek or Balkan Style Yogurt (Optional) - It gives this dish some extra creaminess, but it's not necessary. 2 Tablespoons of chopped Fresh Cilantro aka Coriander (Optional) - It adds great flavor and freshness but if it tastes like soap to you, don’t add it. In the pan on medium high heat, heat the olive oil until it slides easily around in the pan. Add the Onion and stir it around until it’s soft and translucent, about 2 minutes. Add the Canned tomatoes, Ras El Hanout, Garlic, hot sauce (if using), some salt and pepper, and a pinch of sugar. Stir everything around with a wooden spoon until it’s bubbling. Taste and adjust for salt, pepper, and spiciness (via hot sauce). You want this sauce to be on the strong side because the eggs and yogurt will temper things quite a bit. Carefully crack in the Eggs. Cover the pan and lower the heat. Cook until the whites of the eggs are no longer translucent – about 3 minutes. Don’t be afraid to lift the lid to check. Spoon some Greek or Balkan Yogurt over some of the tomato sauce and sprinkle with Green Onions and Fresh Cilantro (if using). Serve with toast or pita bread and enjoy!